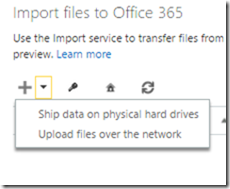 As I spoke about in a previous post, Microsoft has started started to roll out the ability to import data like PST files directly to Office 365. If you have the first release enabled on your tenant you may now see the Import option appear on your administration menu on the Office 365 portal. Select that will take you to the above page. You can then elect to Ship the data on physical hard drives or Upload files over the network. It is expected that we will soon see the ability to not only upload PST data but also data to SharePoint and OneDrive for Business via this method. This is going to make it a lot easier to get large volume of information up to Office 365 much quicker than before.